Dallying In The Dirt, Issue #236--- Rabbits have a finicky taste in Heucheras. I must have the world’s fussiest rabbits. At least it’s the rabbits that I’m blaming. 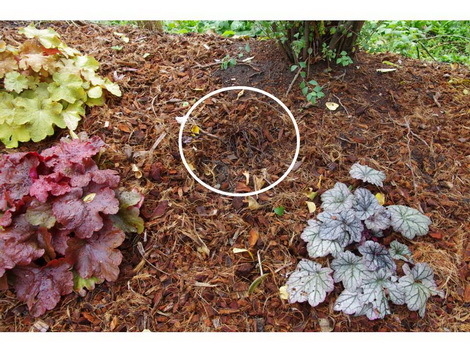 In my ongoing effort to redo the berm at the back of the yard, I decided I needed a collection of Heucheras. They have lovely coloured foliage and they are happy in some shade. I mixed in a couple of Tiarelleas and a couple of crosses between the two known as Heucherellas. They look very nice against the coconut shell mulch and they have been growing quite a bit over the season. If you look at the picture there is a white circle. Inside that circle, if you look closely you can see some black short stems. What is there about that particular variety that appeals to the rabbits. You notice the ones right beside it are not touched at all but every leaf on that variety is gone???? We have made almost the middle of October without any hint of frost and the garden keeps yielding its part of the delicious bacon and Tomato sandwiches and the Tuberous Begonias that I grew from seed are magnificent. It will be interesting to see if they make tubers that are big enough to keep for next year. They were so successful that we have already had some more seed shipped over from Blackmore and Langdon in England and we will start them a bit earlier this winter. This small flowered Phalaenopsis Orchid has spent the summer outside and has developed several bloom stalks, each with many buds on it. It came inside today so that we can watch all the blooms open and brighten up the kitchen. A couple of the others are starting some bloom stalks and will be inside by the end of the weekend. 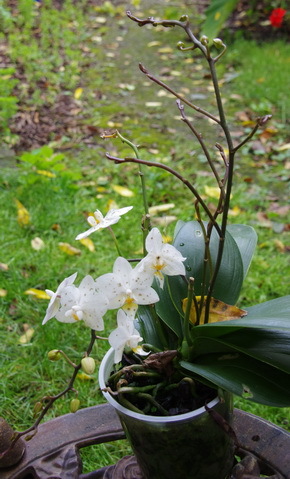 The cool nights are hopefully initiating blooms in many of the Orchids that are still enjoying the sunshine outdoors. The two, early, bright yellow Cymbidiums are already showing some developing bloom stalks and should be brightening up the solarium before Christmas. I do keep an eye on the weather reports at this time of year and stay ready to carry lots of plants inside when it looks like a frost might be upon us. There a few nice plants that have been in the garden for a while and tend to be ignored and then some years they just choose to put on a great show. 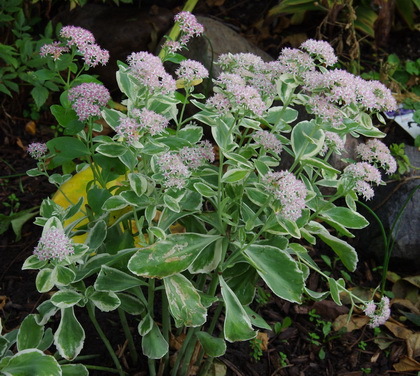 This variegated Sedum fits into that category. Lovely foliage and then a great bloom late in the season. This plant does get cut back in early summer to help it stay short and bushy. It also has to be watched carefully. You can see the two branches near the left back that have green leaves. Like many variegated plants it does regularly try to revert. I’ll need to cut those two branches out when the blooms are done and make sure they don’t start to grow again next spring. I have a few very nice long fruit from my Zucchini trombata, the climbing Zucchini and I have a new recipe for Zucchini and Garlic soup that was delicious and I will try and share with you next week. Writing this edition has been long and painful. I was watching the Toronto / Texas Baseball game and after 4+ hours of tension my Blue Jays managed to lose. How was that possible. Bernice Asks? Have there been any trials on using LED tube lights to replace florescent tubes for grow lights? Have you ever used them and how do they compare? Ken Answers! There has been considerable research done on LED lights as grow lights. They are as effective as fluorescent lights and because they produce little heat they can be used even closer to plants than other light sources. The research clearly shows how much more efficient they are, reducing the costs of lighting by as much as 400%. In a home environment this may not be a significant dollar amount but in a commercial growing situation it is significant. For the home grower, can the energy savings pay for the capital costs of LED fixtures?